Wedding sparklers add a real flare to your wedding day and the photos make for a perfect final image for a wedding photo set or album. My preferred method of photographing wedding sparklers photos is as you see here. In a way, it's very similar to a confetti photo. I usually look to create two lines of people, one of either side of an imaginary aisle, with the bride and groom at one end. You always have to make sure that some of the wedding guests hold their sparklers above head height, and some below - otherwise you risk blocking out the bride and groom's faces completely. 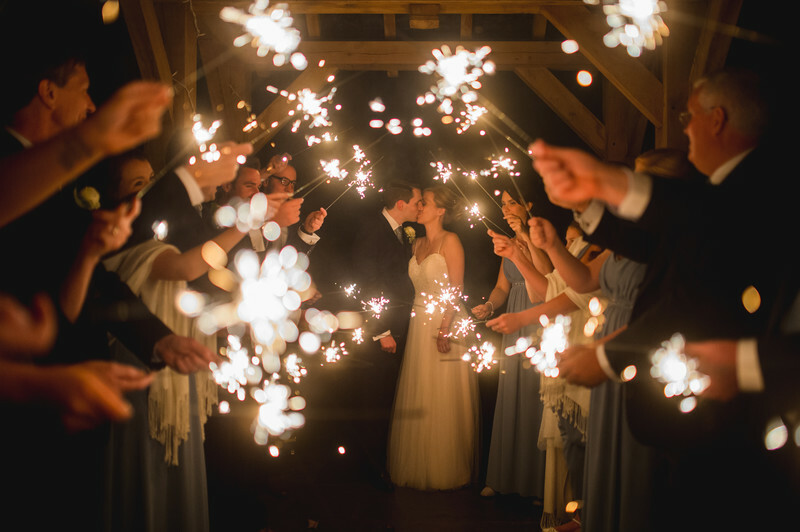 In terms of lighting, I only use the light from the sparklers themselves for the images. This creates a warming glow but most importantly, makes the sparklers look extra bright and apparent in photos. There's always a temptation when it gets past sunset to use artificial light to try and enhance the image, but you always risk washing out the sparklers completely. For this documentary style wedding photo, we were forced to use an outdoor chair store that was used to protect chairs that are intended for use with outdoor ceremonies at the venue. When we'd gone outside for the photo, it was pouring with rain, much as it had been all day. We were lucky that this chair store was there as we otherwise wouldn't have been able to have taken this photo.